My plan was to make a fun Halloween themed drink for this week’s Thirsty Thursday so I did a search on Pinterest (my new obsession) and found a layered cocktail designed to look like candy corn. Cute, right? So I gave it a go, but layering pineapple juice with vodka, orange sherbert and milk is harder than it sounds. But it was still an orange drink in a cocktail glass and was fitting for Halloween so I was going to roll with it... but sadly it was more of a trick than a treat. It tasted terrible. So I thought back to a layered drink we successfully made on our Alaska boat trip this summer: The Dark and Stormy. It may not be orange but “dark and stormy” is very fitting for a fall cocktail! And this one is not only simple to make, but tastes 100x better! Fill a glass with ice. Squeeze lime wedge over the ice. Pour in some ginger beer or ale. Float dark rum on top by slowing pouring it over the back of a spoon. Drink. I'd recommend sticking with a Dark and Stormy. And in the spirit of Halloween: Drink up Witches! I love Dark & Stormy's. I made them on the boat with some damn good rum. Great pictures and sorry that drink didn't turn out. How exactly could you get those to layer? Haha Love it! Dark and Stormy is perfect for Halloween and the ingredients sound way better than the Candy Corn drink anyway. 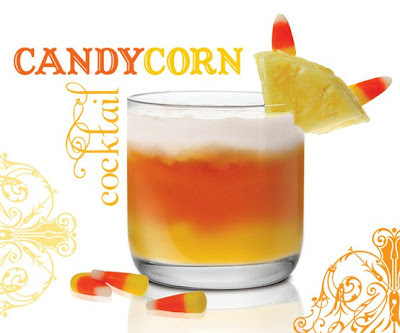 That candy corn drink sounds absolutely disgusting. I understand the Halloween appeal, but am shocked you'd even give that a go!!! The thought of pineapple juice and milk makes me want to throw up! The Dark & Stormy, however, sounds very cool! Ginger & Rum- sign me up! The Dark & Stormy looks great though!